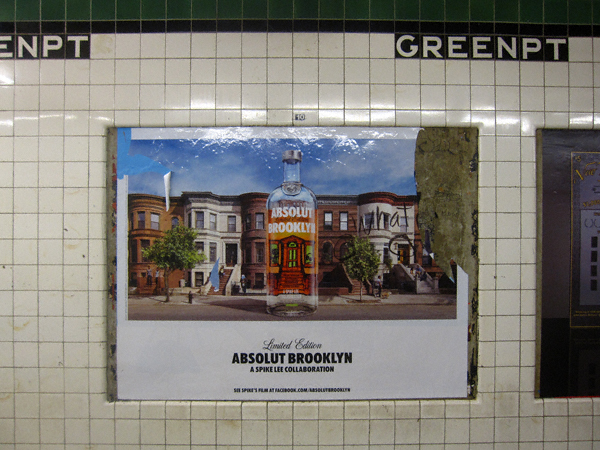 It has come to my attention that the folks at Brownstoner have been speculating as to where the photograph for this heavily Photoshopped advertisement (as seen here gracing the Crosstown Local) was taken. Well, today dear readers, I am pleased to announce I have the answer! 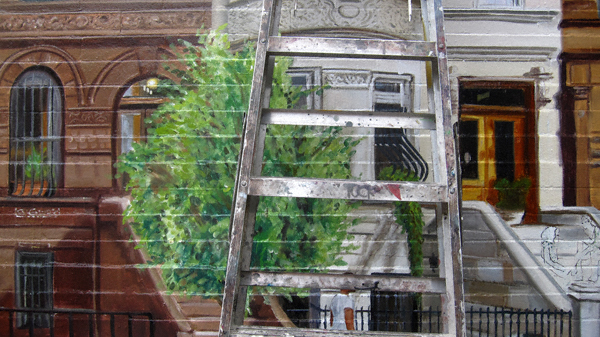 I spied this chap painting an advertisement for this “Spike Lee Collaboration” this afternoon on Bedford Avenue. I struck up a conversation with him. I knew exactly how to break the ice. Excuse me, but are you going to paint in the street numbers for these two houses? I don’t know. The type is awfully small. He replied, while looking at the print out he was working from. Well, the one on the left is “400” and the one on the right is “387”. Did you work on this campaign? This discrepancy was brought to my attention while waiting for the G train. Someone circled the addresses and wrote “WHAT” in all caps. When one has to wait 15-20 minutes on a subway platform he (or she) tends to notice such things. In any case you might want to fix that. May I suggest you make the building on the right “398”? The block in question is located in Crown Heights. The buildings (some of them anyway, including “387”) were originally three stories in height. They were shaved down to two so more sky would be visible. All the trees were added via Photoshop. A wonderful synchronicity to be there at the right time. And great proof that advertising is the insolent daughter of art. He was a really nice guy. I hope he doesn’t get in trouble for this— and that he fixes the street numbers! 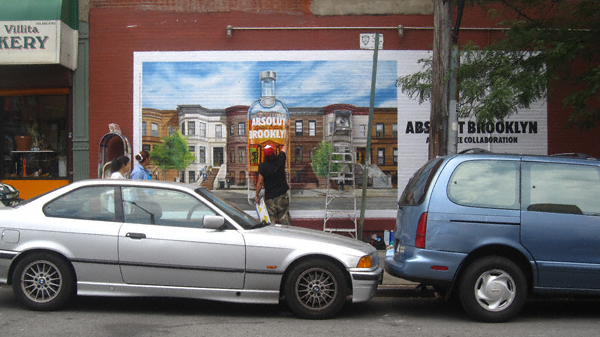 Hi, I’m doing a story on the Spike Lee Absolut ads. I also live in Bed Stuy. Can you tell me where in Crown Heights this photo was originally taken? Thank you!